Somehow, I haven't managed to move on from my fossicking adventures with the contents of the resin box yet. I know I said it was time to put it aside and get on with some crafting for the festive season but the resin bug has bitten me hard this week and it just won't let go. No matter how hard I fight it, I can't seem to get it out of my system. So rather than fight it, I gave in to it over the weekend. Here's what I got up to. Firstly, a jelly bean coloured button necklace...... .....featuring a sprinkling of Plaid Fresh leaf charms and resin beads tucked amongst the buttons. Nice and bright and in almost every colour of the rainbow. Those buttons look good enough to eat! 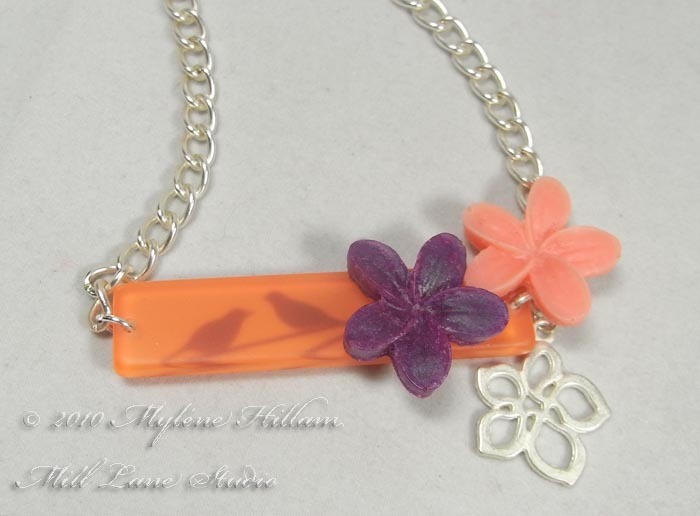 How about this one for feeling summery and tropical. It might be cold and snowy in the northern hemisphere, but here in subtropical Brisbane, it's summer and what says summer more than frangipanis? Don't you love the silhouetted birds? 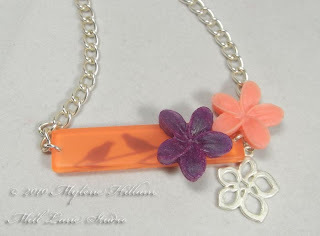 It's a Plaid Fresh Pendant - and it goes perfectly with the salmon frangipani. 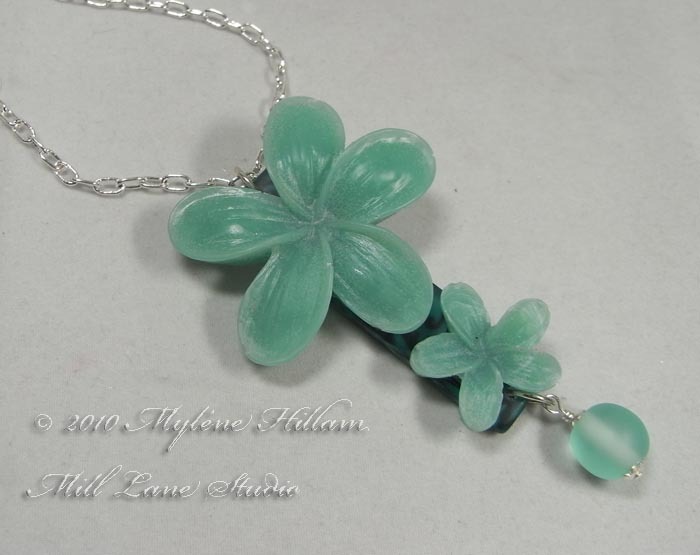 The photo of this last piece doesn't show the pendant base very clearly but the colour was perfect for these minty looking frangipanis. The bead dangle at the bottom is also from the Fresh range. I fell in love with the Plaid Fresh line the moment I first saw it a couple of years ago and it's why I still have a quite a selection of beads and charms in my stash. They work so well with the resin pieces I cast which is not really surprising seeing as that they are both made of resin. Oh, and in case you're wondering, I used Krafty Lady art moulds to cast all these pieces. Because they're made of flexible silicone, they make demoulding a breeze. OK, this time, I really am putting the resin box away. Christmas is less than a couple of weeks away and I have a lot of crafting and decorating to catch up on, so hopefully my next post will be a little more Christmassy! Gingerbread House - Construction Complete!